In Buddhism, portrayals of the union of male and female deities show the cosmic merging of the masculine-feminine, which in truth are never separate—yin/yang, shakti/shiva. The universe is forever created, sustained and dissolved through their eternal union in ecstatic bliss. The central image is a magazine photograph of a sculpture of a couple joined in love. They are haloed by a ring of cosmic dust resulting from a supernova explosion, bursting with moons and a white lily that sends off a shower of stars. Their couch is a swirling galaxy on a bed of flowers. 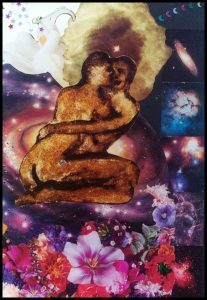 Rising along the side, like energy rising up through the chakra centers along the spine, are a series of cosmic images the couple gives birth to: the Eagle nebula at the bottom; a trailing remnant of the Vela supernova; the Pleiades; the Trifid nebula; and the Andromeda galaxy.